Animal lovers are appalled by a recent suggestion from a federal advisory committee. According to The Verge, the National Wild Horse and Burro Advisory Board of the Bureau of Land Management (BLM) recently recommended that 45,000 wild horses and burros be sold and/or killed by a range management group currently holding the animals in government-run holding facilities. To prevent them from overgrazing, these wild horses and burros were initially rounded up off the western rangeland owned by the government and used by beef farms. For years, the government has been removing the animals from their natural habitat and putting them into facilities where they can be adopted out. This grim new measure, which would be partially paid for with tax dollars, was proposed after the committee decided it is too expensive to care for the horses and maintain over-crowded facilities, reports The Dodo. This adds more fuel to a fiery debate about whether the government should allow the land to be used for for-profit cattle raising and, in turn, permit wild animals to be removed from that land for the benefit of beef farms. The BLM spent nearly half the program’s entire budget, $49 million, caring for the wild horses and burros it took off the land. Many critics of the BLM are angry with how the agency has chosen to handle the problem of overgrazing, stating that the program should look into birth control options for the wild animals instead of capturing and/or killing them. Unfortunately this isn’t the first time the BLM has been connected to the murder of wild horses. 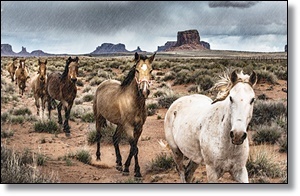 Last October, the agency sold 2,000 of the federally-protected animals to a buyer who planned to slaughter the horses.